An Austentatious Afternoon Tea Catering Company! 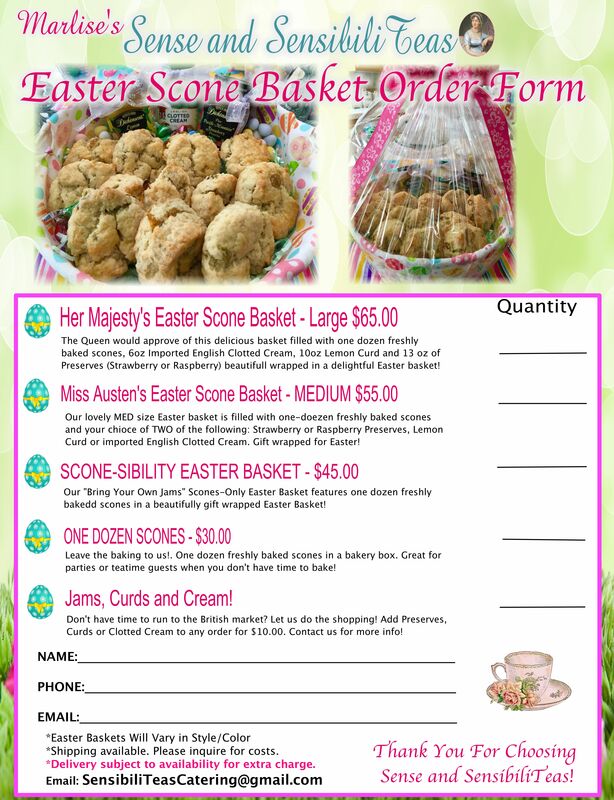 Easter Scone Baskets – Orders NOW OPEN!! THANK YOU TO OUR VALENTINE CUSTOMERS! Valentine love for Mrs. Paguyo! Return Customer! Thank you Donna! Scones for the Wedding Couple! ORDER Your Valentine Scones Gift Box TODAY! Fill out form and email to: SensibiliTeasCatering@gmail.com You will receive a confirmation email and instructions for payment via Paypal or Check. Limited delivery availability for extra charge. Order Your Valentine’s Double-Dipped Chocolate Chip Cookie Gift Basket! Marlise’s Sense and SensibiliTeas™ is NOW accepting limited bookings for private afternoon tea parties and events in 2019! Imagine an expertly executed authentic English Afternoon Tea at your next special event, brought to you by Anglophile Channel Productions! 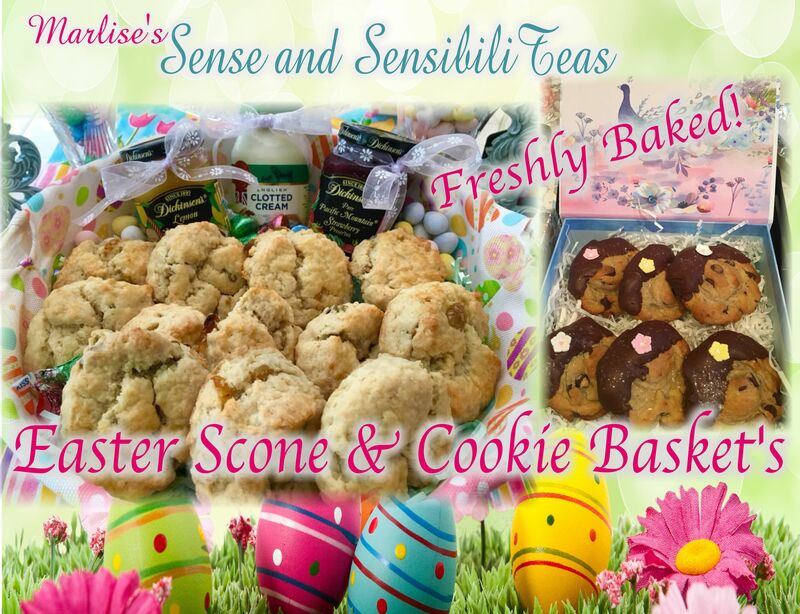 Marlise’s Sense and SensibiliTeas™ provides bespoke Afternoon Tea Catering experiences for your special event. Choose from a unique array of afternoon tea experiences. Our Austentacious Theatrical Novel-Tea brings to life Jane Austen’s beloved characters and stories right before your very eyes whilst you enjoy a traditional English afternoon tea served by our costumed Pemberley Tea Ladies! Jane Austen’s beloved characters come to life right before your eyes! Imagine having tea with Mr. Darcy or Elizabeth Bennet! All our afternoon teas are served by our costumed tea ladies wearing Regency-style gowns or Olde-Worlde lace caps and aprons. You may also choose the Regency Afternoon Tea for a more traditional afternoon tea experience. Our elegant sit-down Regency Tea features delicate tea sandwiches, freshly baked scones slathered in authentic Devonshire clotted cream and homemade preserves, and a grand finale of sumptuous pastries and British sweeties. No afternoon tea party would be complete without endless pots of proper British tea, served hot in a selection of flavors. Traditional English Afternoon Tea served up by Sense and SensibiliTeas. Traditional English cucumber sandwiches are just some of the tea time choices for your special tea party! Our Dashwood Afternoon Tea Buffet offers a more casual serve-yourself option to your guests but the quality remains the utmost of deliciousness. Included are: starters, a selection of tea sandwiches, freshly baked scones served with lemon curd, preserves and clotted cream and an array of bite-sized desserts and pastries. Our buffet tables are staffed by our Pemberley Tea ladies or guests may choose to serve themselves. Sense and SensibiliTeas Afternoon Tea experiences are fully catered and served on authentic English bone china. For our Dashwood Afternoon Tea buffet, your guests may enjoy being served on china or on high quality disposable dinner and flatware. All our sit-down afternoon tea is served on authentic English bone china! An assortment of english bone china tea cups. Additional menu offerings that may be added to your tea party experience include: Fresh vegetable tray and spinach dip, Seasonal fruit tray, Quiche, and Salads. Additional menu items may be added to your experience. Check our tea menus! The most beautiful afternoon tea I’ve ever experienced, and I’ve been to quite a few. Her Majesty, Queen Elizabeth would especially approve of the scones! Best afternoon tea party I’ve ever been too! I truly felt transformed to another era. The food and presentation was beyond compare! Regency Afternoon Tea includes full sit-down table service on English Bone China, flatware, napkins, serving ware, tea pots. Not include in price: Tea servers/staff, Flowers, Centerpieces, table linens, chair embellishments. Please inquire for prices on those items if interested. If you provide full chinaware the catering price is $39.95 pp. The Dashwood Afternoon Tea Buffet includes high quality disposable dinnerware and napkins, serving ware, tea pots and beverage dispensers. Not include in price: Tea servers/staff, Flowers, Centerpieces, table linens, chair embellishments. Please inquire for prices on those items if interested. English bone china or theme paper goods may be provided for an extra charge. An Austentacious Afternoon Tea is a full-service theatrical experience like no other! Our uniquely entertaining Austentacious Afternoon Tea is like no other tea experience around. Imagine scenes from Jane Austen’s most beloved novels, such as Pride and Prejudice, performed right before your very eyes, all while enjoying a traditional 3-course afternoon tea. Imagine tea with Mr. Darcy or Elizabeth Bennet! Our Pemberley Players also interact with our guests and are available for photos – but remember, conversation is strictly limited to 19th Century drawing room fare! Limited bookings are accepted for this special occasion tea. Not all dates are available. For more information, inquire at: SensibiliTeasCatering@gmail.com. MORE SPECIALTY TEAS COMING SOON! Featuring a very famous British Nanny! Sense and SensibiliTeas is owned and operated by Marlise Boland – Creator/Producer/Host of The Anglophile Channel, the award-winning British entertainment channel. Starring our award-winning hosts, Marlise Boland and Elyse Ashton and featuring celebrity guests, tea room visits, teatime tips and more!